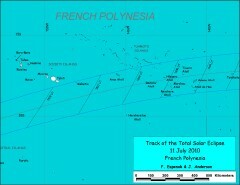 The point of greatest eclipse (totality phase during 5 min 20 sec) lies in the middle of the Pacific Ocean in between French Polynesia and Easter Island. 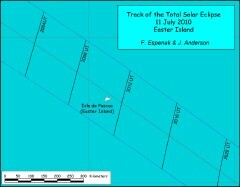 Totality will last between 4 minutes 21 seconds and 4 minutes 46 seconds at those two locations, with very good chances to see the eclipse in the Tuamotu Archipelago and to a lesser extent from Easter Island. In Patagonia an eclipse flight will be provided to optimize the chances and at the same time add nearly a minute to the totality duration. To observe the 2010 July 11 total solar eclipse, with my "Eclipse-City" associates, we offer tours in the Tuamotu Archipelago in French Polynesia, on Easter Island in Chile and in argentinean Patagonia for those with a tight budget. 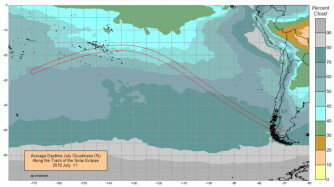 This is page 1 | Page "Bora Bora" | Page "Tatakoto-Tahunatara" | Page "Eclipse" | Page "Google Map" | Page "Cloud Cover"